Results from an annual survey have been released. WHAT IS YOUR most memorable Irish sporting moment from the past year? In an annual survey, Shane Long’s match-winning goal against world champions Germany at the Aviva Stadium has topped the poll with 27% of the votes. Paul O’Connell’s heartbreaking injury against France in the Rugby World Cup (22%) was second, ahead of Ireland’s Six Nations win, Jon Walter’s goal in the Euro 2016 play-off with Bosnia-Herzergovina (8%) and Billy Walsh’s resignation as Ireland boxing team coach. 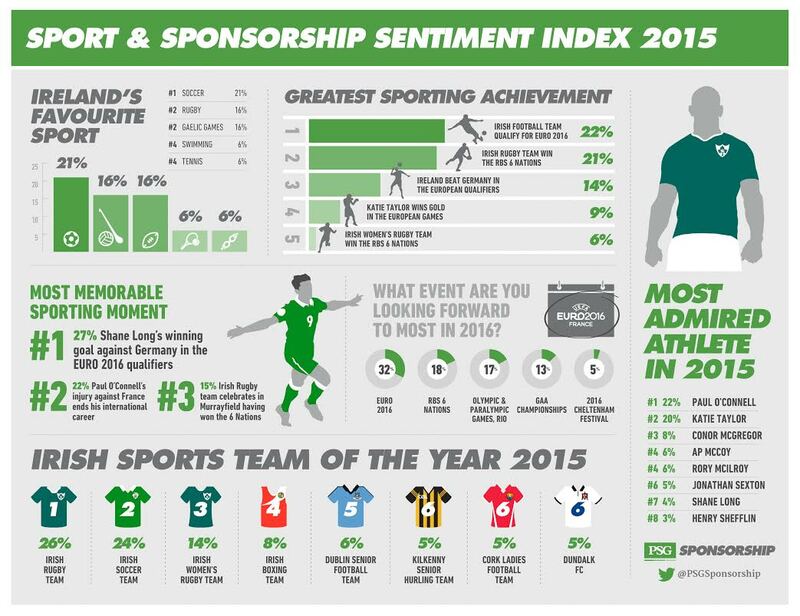 Results from the PSG Sport and Sponsorship Sentiment Index 2015, which is taken by 1,000 people nationwide, also rank Ireland’s qualification for Euro 2016 (22%) slightly ahead of the men’s Six Nations triumph (21%), the women’s Six Nations success (6%) and Katie Taylor’s gold medal at the European Games. However, Paul O’Connell (22%) is voted the most admired Irish sports star, with Katie Taylor (20%) and Conor McGregor (8%) directly behind the Toulon man. “Once again it was a very good year for Irish sport. For a small nation, our sports teams and sports stars continue to have success on the fields of play, in the boxing ring, on the track and elsewhere. Our passion for Gaelic Games remains strong while our international teams are competing with the best. Who should win RTÉ’s Team of the Year? Email “Shane Long's magical goal against Germany voted Ireland's sporting moment of 2015”. Feedback on “Shane Long's magical goal against Germany voted Ireland's sporting moment of 2015”.